Group News Blog: Have Some Common Sense With That? Have Some Common Sense With That? 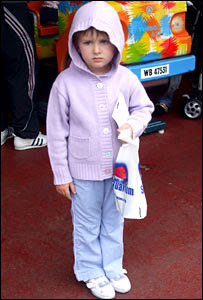 A four-year-old girl was asked to take down the hood of her cardigan while visiting a seaside amusement arcade. Karen Lewis's mother Cheryl, from Shrewsbury, said her daughter was upset following the incident at Les Harker's Amusements in Rhyl during a holiday. She said Karen was with her granddad playing on the 2p machine when a worker made the request because of "security". The arcade owner has defended the decision saying that his employee was only following instructions. What was that last bit again? "And if all the other children ran over the edge of a cliff, would you follow them? Then get your self home on time for dinner and don't give me any lip, or I'll break this spoon on your be-hind. Now MOVE!" Great Ovaries of Penelope, when will people learn to think for themselves? !